For as long as the Internets have been around, people have been posting all sorts of wild stories about every conceivable subject, including aviation. These tales are called “Urban Myths” on the street, and “eRumors” online. Recently I found a site called truthorfiction.com that serves the web community by delving into many of these stories and either proves them to be truth, or debunks them as fiction. Satellite Pictures of Shuttle Columbia Disintegrating-Fiction! Carrier pictures of secret new stealth fighter?-Fiction! Jet fighters' formation spells USA-Fiction! 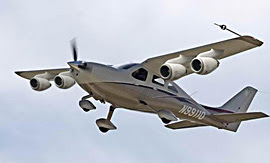 The story says that the Boeing Company is developing a radical new passenger jetliner that will carry 1,000 passengers. It's designated the 797 and is a "blended wing" design looking a lot like the old flying wing experiments of the 50's. TruthOrFiction.com went straight to the source, the Boeing Company. A spokesperson said that it is not true that Boeing is developing a commercial blended wing aircraft. He asked that we help stop the perpetuation of the story. What is true, according to Boeing, is that Boeing Phantom Works, the company's advanced research and development organization, is doing research on the blended wing body design as a potential military aircraft. Boeing has built a scale model to test its low-speed flying characteristics in a wind tunnel. The power of the Internets to start these crazy eRumors is immense. Now all I have to do is sit back and watch this rumor of a jet-powered NGP explode across cyberspace.